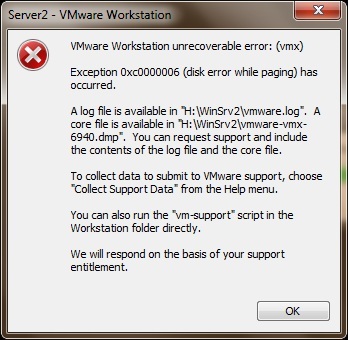 TechSpot: Error While Resuming Suspended VM Guest; VMWare Workstation Unrecoverable Error: (vmx) Exception 0xc0000006 (disk error while paging) has Occurred. Error While Resuming Suspended VM Guest; VMWare Workstation Unrecoverable Error: (vmx) Exception 0xc0000006 (disk error while paging) has Occurred. Issue Description: VMWare virtual machine is throwing error while resuming suspended virtual machine. This is basically related to disc error occurred while paging. 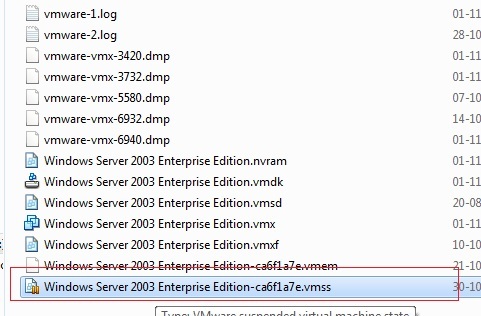 A log file can be found at Virtual Machine location with the name ‘vmware.log’. 2011-11-01T10:57:25.049+05:30| vmx| I120: Warning: the system was unable to load a page of memory; this can be caused by network problems or a failing hard disk drive. 2011-11-01T10:57:25.049+05:30| vmx| I120+ Exception 0xc0000006 (disk error while paging) has occurred. 2011-11-01T10:57:25.049+05:30| vmx| I120: [msg.panic.haveLog] A log file is available in "H:\WinSrv2\vmware.log". 2011-11-01T10:57:25.049+05:30| vmx| I120: [msg.panic.haveCore] A core file is available in "H:\WinSrv2\vmware-vmx-6940.dmp". 2011-11-01T10:57:25.049+05:30| vmx| I120: [msg.panic.requestSupport.withLogAndCore] You can request support and include the contents of the log file and the core file. 2011-11-01T10:57:25.049+05:30| vmx| I120+ To collect data to submit to VMware support, choose "Collect Support Data" from the Help menu. 2011-11-01T10:57:25.049+05:30| vmx| I120+ You can also run the "vm-support" script in the Workstation folder directly. 2011-11-01T10:57:25.049+05:30| vmx| I120: [msg.panic.response] We will respond on the basis of your support entitlement. Solution: This is an unrecoverable error. Once you suspend a virtual machine, there won’t be an option to shut down or restart the machine. Resuming is the only possible option. Now try to boot up the virtual machine. But you will not be able to resume from the suspended state, hence you will lose all the open data and applications.